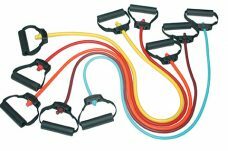 STRENGTH BANDS - Rae Crowther Co.Rae Crowther Co. Quantity discounts available! See item description below for details! Strength Bands are a cost-effective exercise tool. Available in 6 resistance levels. They are adaptable for multiple ages and fitness levels. A one stop shop in helping athletes. You can adjust the amount of resistance during exercise by adding pre-tension, standing closer or farther away, or combining bands together. Strength Bands can be used for any exercise and for every muscle group.